Air fares for U.S. domestic flights sink to their lowest levels 57 days before departure, on average, according to a Wall Street Journal report of an Airline Reporting Corporation study that looked at sales through online and traditional travel agencies but not through airlines directly. That’s well before the average purchase date, which is just over 1 month before departure. Fares bought in the U.S. for international flights hit their lowest levels 171 days prior to the flight date. Looking for an airfare deal? Your odds improve if you buy on the weekend. A new deep dive into airline fares suggests Sunday is the best day to find low fares. This is a departure from the conventional wisdom of recent years, when Tuesday was considered the best bet. Airlines Reporting Corp., which processes tickets for travel agencies and handles about half of all tickets sold, tallied up ticket sales. Over a 19-month period ending in July, 130 million domestic and international round-trip tickets worth $94 billion showed the lowest average price, of $432, was on Sunday. At $439, Saturday’s average is also lower than Tuesday, which averages $497. One factor behind the change: Airline executives come into work Monday looking to raise fares, not discount them with sales to fill seats. Just this week airlines put through a $2 each-way across-the-board fare hike, even though prices for oil—the largest expense for airlines—have been plunging. Prices are still going up due to increasing demand for the limited number of available seats. The lower Sunday and Saturday prices also result from the ability social media has given airlines to throw discounts in front of consumers at any time. That turns vacation shoppers surfing the Web on weekends into ticketed passengers without discounting tickets business travelers might buy while at work. And the findings reflect the lack of corporate sales over the weekend, since business travelers typically fly on more expensive tickets than vacation buyers. When searching for the lowest fare, don’t give up on Tuesdays. It’s the day with the most frequent price drops, leaving the door open for good deals. Yapta Inc., a firm that alerts travelers and travel managers to declines in ticket prices, says 21% of the price drops it has recorded happened on Tuesday and 19% on Wednesday. That’s often the result of fare sales launched early in the week. Airline pricing executives say the historic pattern has been for airlines to add up sales over the weekend and decide on Monday whether to stimulate purchases with discounts they tout in ads in Tuesday’s newspapers. Tuesday also turns out to be the busiest day for domestic ticket sales and the cheapest of the workweek, though all weekdays hover around $500. The ARC study, which looked at tickets sold in the U.S. through online and traditional travel agencies but not airlines directly, also showed that the cheapest time to buy domestic trips was 57 days—about two months—before departure. Most people don’t buy that early: The average purchase date was just over one month before departure. By then prices have started their climb. The average domestic round-trip, including taxes and government fees, was $496. Yet 57 days before a flight, the lowest average was 19% lower, at $402. 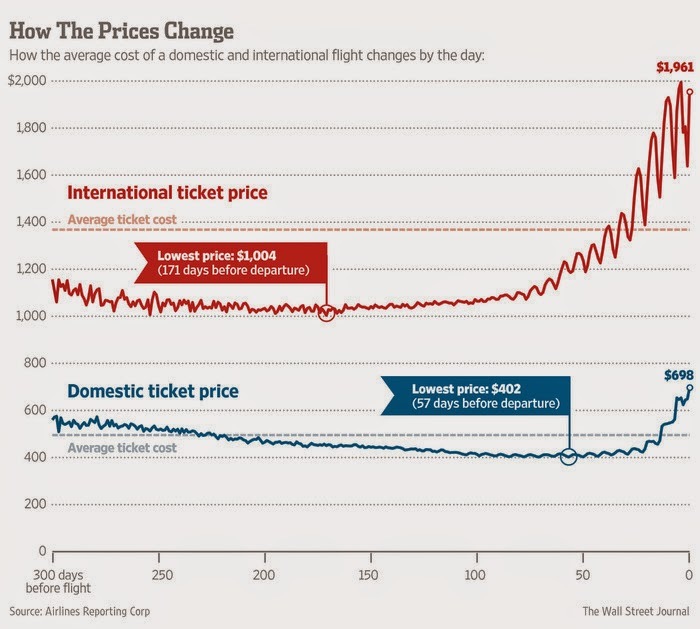 International ticket prices didn’t fluctuate much between 10 months and three months before departure. Through that seven-month period, the average price of tickets sold range between about $1,000 and $1,150. Then about three months before departure, airlines start raising prices. Most people book too late to get the lowest price, of course. International tickets get sold, on average, two months before departure. Average cost: $1,368. Hopper, a Cambridge, Mass., firm that analyzes prices and flight searches in giant reservation systems, says the average consumer spends 12 days shopping for airline tickets. Consumers watch prices bounce up and down, or at least hope they’ll drop, even though increases are more common. On average, prices rise 5% in that typical 12-day shopping window, Hopper said. Leisure markets like Hawaii and Florida tend to have more stable prices, while business-oriented destinations like Washington, D.C., and Chicago have more price volatility, Hopper notes. One tip for uncertain fare-watchers: The Transportation Department requires that airlines give refunds for tickets canceled within 24 hours of a purchase, or offer a 24-hour hold, for tickets bought more than a week before departure. Booking sites don’t usually mention the free cancellation prominently, but if the price does suddenly go lower, you can cancel one reservation and rebook without a penalty fee. Delta, United, US Airways, Alaska Airlines and JetBlue offer the 24-hour free cancellation; American doesn’t but lets you hold a reservation for 24 hours without paying. To get the cheapest tickets, you have to plan even further in advance than you used to. In a 2012 study, ARC found the lowest prices for domestic tickets at 42 days before departure, over two weeks closer than the current 57-day threshold. For the past several years airlines have consolidated and cut capacity, creating more demand for each seat, especially as the economy has rebounded. That’s meant prices start higher and go up faster. “Some of those lowest-priced tickets sold out faster than in the past,” says Chuck Thackston, ARC’s data specialist. For holiday travel, airlines stay one step ahead of shoppers, and the cheapest days to buy have already passed, according to Orbitz. The travel seller says the best time to buy for Thanksgiving was Oct. 10. The sweet spot for Christmas was even earlier, Oct. 8. Orbitz says it only sold half of the tickets it will sell for Thanksgiving by Oct. 16; it expects to sell 75% by Nov. 7. But a significant number of procrastinators will purchase tickets in the last three weeks leading up to the holiday. So far this year prices have been up 2% over last year’s prices. For Christmas travel, prices have been up about 5% this year compared with last year, Orbitz says. That’s well before most people commit. Orbitz doesn’t anticipate reaching the halfway point on Christmas ticket sales until Nov. 9. If it’s any consolation, booking early rarely saves much around the holidays. Hopper says last year prices for Thanksgiving travel actually didn’t vary much until 10 days before the holiday. In general, airlines know they’ll fill their flights so prices start high and stay high.